2012 August | Federation of North-American Explorers | Semper Parati! Sub tuum praesidium confugimus, Sancta Dei Genetrix: nostras deprecationes ne despicias in necessitatibus nostris: sed a periculis cunctis libera nos semper, Virgo gloriosa et benedicta. Every year for the past twelve years, Mater Ecclesiae Chapel in Berlin, NJ, has held a Mass of Thanksgiving (in gratitude for our erection as a Latin Mass mission within the Diocese of Camden) on the Feast of the Assumption of the Blessed Virgin Mary. Due to the small size of Mater Ecclesiae’s church building, it has been held at various churches in the region — at Camden’s Cathedral of the Immaculate Conception; at St. Peter Church in Merchantville, NJ; and last year at St. Peter the Apostle Church (National Shrine of St. John Neumann) in Philadelphia, PA. This year we returned to St. Peter in Merchantville and, because of scheduling conflicts with our host parish, anticipated the feast and celebrated Mass on the evening of Tuesday, August 14, 2012 A.D. My family and I have assisted at this Mass since 2004, missing one year, so this year’s Mass was our eighth. However, thanks in no small part to the kindness and leadership of our rector, Fr. Robert Pasley, this was the first time I was able to participate directly in the Mass, as a member of the Federation of North-American Explorers (for European readers, the Federation of North-American Explorers are affiliated with the UIGSE-FSE, a Catholic faith-based youth movement and scouting organization prominent in Europe), whom Fr. Pasley graciously permitted to take part in the procession before Holy Mass. 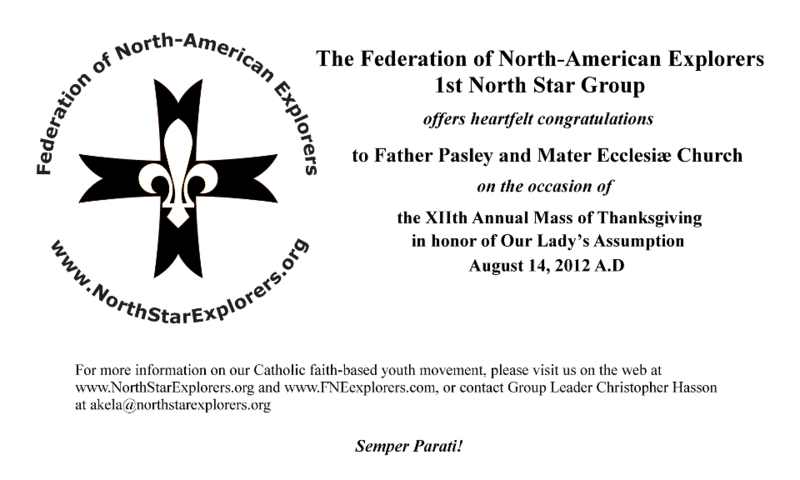 The Federation of North-American Explorers, 1st North Star Group, offers heartfelt congratulations to Fr. Pasley and Mater Ecclesiae Church on the occasion of the XIIth Annual Mass of Thanksgiving in honor of Our Lady’s Assumption – August 14, 2012 A.D.
Joachim (whose name means Yahweh prepares), was the father of the Blessed Virgin Mary, grandfather of Our Lord, and husband of St. Anne. His feast day is August 16th, the day after the Assumption. 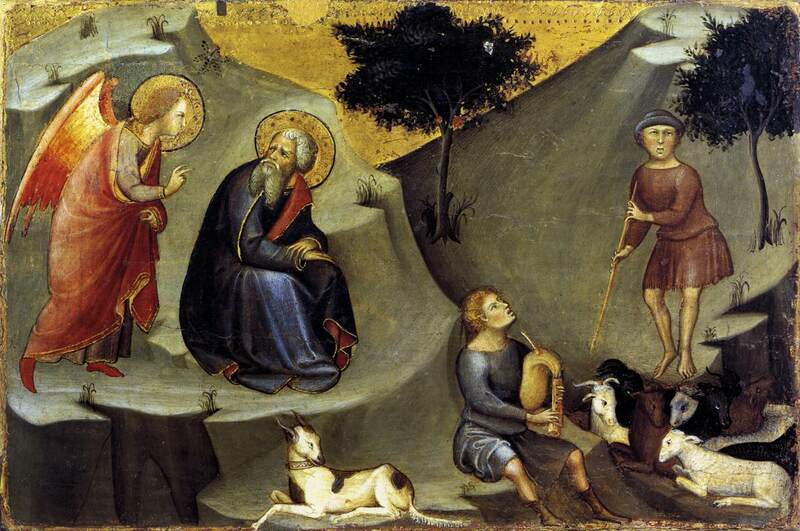 Joachim was from his youth brought up in piety and the fear of God. The parents of the Blessed Virgin, who, first lived in Galilee, came later on to settle in Jerusalem, where Mary would be born. A church, known at various epochs as St. Mary, St. Mary ubi nata est, St. Mary in Probatica, Holy Probatica, St. Anne, was built during the fourth century, possibly by St. Helena, on the site of the house of St. Joachim and St. Anne, and their tombs were there honoured until the close of the ninth century, when the church was converted into a Moslem school. The crypt which formerly contained the holy tombs was rediscovered on 18 March, 1889. This holy couple divided all their goods into three parts. One for the temple, one for the poor, and one for themselves. But Joachim’s married life with the pious aud chaste Ann was childless until they had reached a great age. Desipite their generous alms, Joachim was afraid their childlessness was a sign of God’s displeasure with him, so he departed from Anne for a time to pray and fast. While away, they both received a message from an angel that Anne had already conceived a child. Joachim’s continual prayer and other good works were the rewarded by God with that blessed child whose birth was the beginning of our salvation. He reared her in the fear of the Lord, offered her in her tenderest years to God in the temple at Jerusalem, and soon after gave up his spirit into the hands of his Creator. Oh, that all Christian parents might learn from the parents of Mary to train up their children, not for the world, but for God, from Whom they have received them, and Who will one day require them again from their hands!